Our International Studies Program students began orientation on Monday, September 1st, focusing on two major themes : understanding Human Rights and the duality of the 'insider/outsider.' Mr. Christopher Hunter, Head of School, launched the theme and then introduced the guest speaker, JJ Kent, an accomplished Native American cultural educator, traditional storyteller and musician. Under the guidance of their teachers, and especially of Mrs. Ann Gardiner and Mrs. Judith Hamery, the students then did theater and art exercises to put the theme into practice. That evening, we were very pleased to welcome many of our families for a BBQ in the Wagram Gardens where new and returning members of our community were able to connect and enjoy a concert by JJ Kent. You may view a video of one of JJ's performances by clicking on his photo to the right. 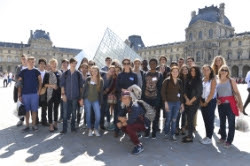 Tuesday's program was centered around discovering the history, geography and spirit of Maisons-Laffitte which was of special interest to the many new students arriving from very distant places abroad. 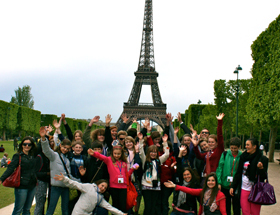 On Wednesday, students explored Paris through visits of the Ile de La Cité, Eiffel Tower, Musée du Louvre and Paris Aquarium. During this time, our IB2 seniors were hard at work in the Science Lab preparing their "Group 4" presentations. To close the orientation week, on Thursday, the FND1 - IB1 students, with their teachers as facilitators, worked collaboratively to prepare presentations reflecting the issues and values introduced during this week. The IB2 students presented their Group 4 projects to their class and teachers, including subjects such as "Mushroom Homes for Human Rights," "A Liter of Light" and "Right to Water." Students also attended a Round Square in Action fair to learn about the various athletic, cultural and service co-curricular activities that will be available to them this year. Friday morning's Student Assembly centered on "Understanding how we work together and the importance of rules." Using a 'case study' method, students separated into small workgroups to discuss everyday disciplinary issues with their teachers. They then shared their recommendations with the student body. Following the assembly, students living on campus departed for an overnight stay at Fontainebleau where a guided tour of the Château and then rock climbing, under the guidance of a local adventure company, awaited them. Students also challenged their teachers to do the "Ice Bucket Challenge," where some lucky IB2's had the opportunity to douse their teachers in an effort to build awareness and fundraise for ALS research. Spectators donated 1€ to watch, and we encourage you to get involved as well. Please visit the link to donate and spread the word to help fight ALS. Relive our #IceBucketChallenge video in all of its glory by clicking on the photo.